Cleaning around your house is an inevitable chore that very few people enjoy doing. From dusting to vacuuming, household chores are not only dull but time-consuming as well. When it comes to cleaning the glass throughout your home, there is little joy, because it seems that no matter what you do, within a few hours, it is covered with dirt and fingerprints. Another problem with cleaning the glass in your home is the harsh chemicals that are common in commercial cleaners. 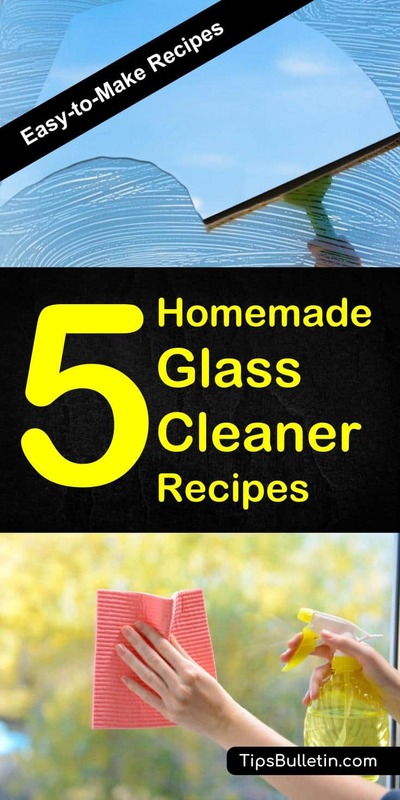 To get away from cleaning with toxic chemicals, here are some great homemade glass cleaner recipes for you to try. There are a lot of ingredients that you already have lying around your house that will make a great DIY glass cleaner. These can be anything from vinegar to soapy water. While using a single ingredient alone does a fairly decent job cleaning your glass and windows, they tend to work better when combined with other all-natural, non-toxic ingredients. 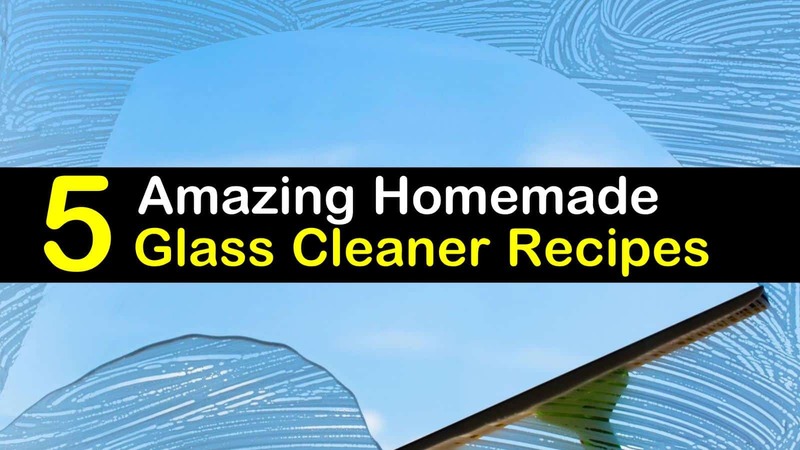 Following up our older post on homemade window cleaner, here are some of the best homemade glass cleaner recipes that you can make with simple ingredients from around your home. Alcohol and white vinegar are excellent substitutes for the chemical-laden cleaners at your local supermarket. Other benefits of these ingredients are they are inexpensive and don’t contain any harsh chemicals or fumes. These ingredients are similar to those you can find in our homemade eyeglass cleaner and in many commercial cleaners, and they evaporate quickly, so you don’t end up with unsightly spots. To make this glass cleaner spray, combine the ingredients and pour the mixture into a spray bottle. Mix well. When you mix the alcohol and white vinegar, you create a glass and window cleaner that quickly evaporates and that competes with the major brand name cleaners. You can also use this solution on ceramic, chrome, and other hard surfaces. Windows and glass surfaces aren’t perfectly smooth. In fact, they have tiny pits across the surface that traps water, causing streaks and spots. The cornstarch in this homemade glass cleaner breaks down the water bonds, resulting in a shiny, spot-free, streak-free finish you’ve ever seen. Mix all of the ingredients in a spray bottle for this glass cleaner recipe. Make sure you shake the spray bottle well to dissolve the cornstarch completely. Spray the solution on your windows and glass surfaces and wipe until the glass is clean. If you don’t wipe the cleaner entirely off the surface of your glass or windows, the cornstarch will leave a residue, defeating the purpose. This formula is excellent for getting filthy windows and glass surfaces clean. The benefits of using vinegar in your homemade glass cleaner are that it is inexpensive and it is incredibly efficient at removing fingerprints and other window grime. White vinegar is often the main ingredient for any good DIY cleaning solutions such as a bathroom or homemade shower cleaner recipes. It doesn’t contain any harsh chemicals or fumes and won’t leave your glass surfaces full of streaks. Combine all the ingredients and pour into a glass spray bottle. Shake well to combine. Spray the solution on your windows and glass surfaces and wipe clean with a microfiber cloth. Don’t worry about it smelling like vinegar; the essential oil will help cover up most of the vinegar smell, while the rest will evaporate once the solution has dried. This glass cleaner recipe combines all the inexpensive ingredients from the previous recipes to give you an ultra, streak-free shine on all your glass surfaces and windows. To get an even more unbelievable clean, use newspaper to wipe the solution off. Newspaper, unlike paper towels and some microfiber cloths, won’t leave lint on your windows. Combine all the ingredients and pour into a spray bottle. You can either use the container you already have from your commercial glass cleaner, or you can purchase an inexpensive plastic spray bottle online. Shake the bottle well to ensure all ingredients are mixed thoroughly. Spray the solution onto your glass surfaces and wipe clean with a microfiber cloth. >> Learn how to clean car windows with simple cleaning tips. The low-profile, glass stovetops are great too cook on and look really sleek. However, if you’ve ever spilled on them while cooking, you know how hard it can be to clean those stubborn, baked-on food stains. In the past on our tip on how to clean a glass top stove, you may have resorted to using the expensive, toxic cleaners that you can find at any supermarket. While these are great for getting your stove clean, they are full of harsh chemicals and can be quite expensive. Here is a great, low-cost solution that you can make at home with products you already have in your kitchen. To clean your glass stovetop, start with one teaspoon baking soda and add enough of the liquid dish soap to form a paste. Apply to the stovetop, and using a mildly abrasive sponge work in circles, focusing on the stubborn spots on the stovetop. Rinse the residue off and wipe the top of your stove down with a microfiber cloth. If you have stubborn stains, you can scrape them off with a flat razor blade before scrubbing. Sidenote: Be careful when using any aggressive cleaner (containing rubbing alcohol or baking soda) on computer screens or TV sets. Instead, learn how to clean laptop screen and TV’s with our 7 computer monitor cleaning tips here. Making a homemade glass cleaner can save you a lot of money because they are made with cheap ingredients that you probably already have sitting in your kitchen. However, if you don’t have the time to make a natural glass cleaner spray, here is a list of the best commercial glass cleaners that you can purchase from Amazon. Bio-Clean is an eco-friendly product that is great for removing hard water stains from the glass surfaces around your house including, shower doors, tiles, windshields, windows, toilets, chrome, and cleaning granite. The product is both safe to use around the house and won’t harm the environment. It contains safe abrasives that will eliminate calcium mineral build-up, lime scale, and acid rain and rust stains. Unger makes a professional, streak-free glass cleaner that is tough on dirt and grime. The product won’t leave streaks, film, or foam on your glass surfaces, and is biodegradable. You can feel safe using this product because it is non-toxic and won’t irritate your skin. The 32-ounce bottle of concentrated liquid will make about 25 gallons when mixed with water. Windex has been a trusted household glass cleaner for generations. Both their no-drip, streak-free version and the original version is great for cleaning all the glass surfaces around your home. This all-purpose cleaner starts working before you even wipe your glass clean and tackles dirt and grease with ease. You can use it on your glass surfaces and windows, both inside and out. Sparkle Commercial Glass Cleaner, by AJ Funk & Co quickly cuts through grease, grime, and film without leaving streaks. The unique purple formula is an alcohol-free and non-ammonia glass cleaner, so it won’t harm, dry out, etch, or pit your glass surfaces. Not only can you use this cleaner on your glass surfaces, but it is also great for cleaning Plexiglas, chrome, stainless steel, and countertops. Cleaning all the glass surfaces in your home doesn’t have to be a time-consuming task. With the right tools, you can quickly clean all the glass in your house without leaving streaks. You’ll need the following cleaning supplies and equipment to clean your home’s glass properly. Note: When cleaning your glass surfaces, you’ll want to avoid using soap products as they will leave a film residue on the glass. The first thing that you will need to do is make your natural glass cleaner by combining one cup water, one cup rubbing alcohol, and one tablespoon vinegar (or can use any of the recipes listed above). Pour into the spray bottle or bucket and mix thoroughly. Next, spray the glass surface with the homemade glass cleaner that you just made. If the surface of the glass is covered in thick dirt, soak the soft cloth in the mixture and scrub the surface in an up and down motion. Using the squeegee, thoroughly wipe the mixture away using one long motion, starting at the top of the glass and moving your way down to the bottom. After each swipe with the squeegee, wipe the blade with a lint free paper towel or microfiber cloth. Repeat the steps until the glass is clean. Using the microfiber cloth, remove any remaining cleaner from the window edges. We’ve provided you with several excellent homemade glass cleaner recipes that will get your glass surface clean without leaving toxic residue in your home. We’ve also provided you with several commercial glass cleaners that you can purchase from Amazon, that will also do a great job cleaning the glass in your home. We hope you found the information in the article helpful, and if there is someone you know who would enjoy this article, please feel free to share it with them.